Last night I witnessed a game of Rugby League with more passion and commitment that any of the three State of Origins played this year. The brutal intensity of the clash between century old foes will undoubtedly eclipse the 50 point victory that the Panthers will inflict over the Tigers in the 2010 Grand Final when Benji and Robbie have simultaneous ‘off’ days. All thirty four players can walk away without their heads held high and their eyes on the late September prize, and the four point margin was a perfect indication of the difference between these two exceptional teams. What has become blatantly evident of late is the inability of the match officials to rise to the occasion. Both the Rabbitohs and the Roosters were victims last night of head-shaking, shoulder-shrugging, ‘what the’ decisions that had the propensity to impact upon the final outcome. Easts were robbed of a brilliant try in the first half and Souths were penalized out of the game with two minutes to go. I’m not suggesting for a minute that my team deserved to win but in these times where Rugby League athletes are earning 3, 4, or $500,000 a season, do we not deserve a better class of referee? As a fan it frustrates me to see dodgy decisions affect the outcome of crucial matches every week. As a one eyed Souths supporter I can name numerous indiscretions against us. I’m sure you, the reader, can name just as many for you own club. Ok, now that I have got all that angst out of my system I’m going to change tack. I am not going to turn this post into a witch-hunt because I can tell you dear reader that being a referee of any sporting code is a tough job. I know this from experience. 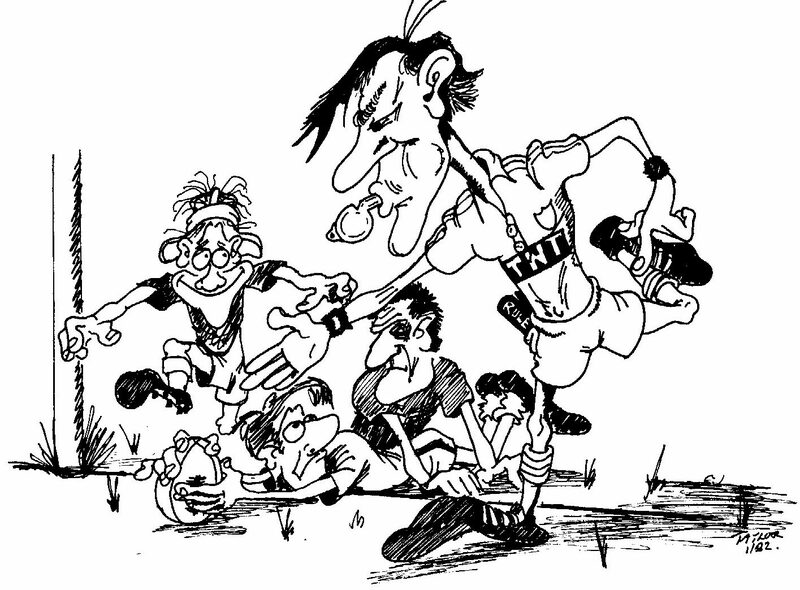 My father refereed Rugby League for some seventeen years (that’s him in caricature) and my two oldest sons have both gone to the park with whistle in hand. I spend every wintry Sunday morning sitting in the stands, grinding my teeth and resisting the urge to punch the blithering idiot next to me who seems intent on denigrating my boys performance regardless of the fact that he is only fourteen and still on his ‘L’ plates. The referee has a truly difficult task ahead of him, or her. With one pair of eyes they police the ten metres, watch the offside and generally try to keep tabs on twenty six large, fast moving men and the plethora of diminutive, gnat like, trainers that constantly invade the pitch. All the while trying in vain to block out the abusive elucidations from the unhappy, not so sober fan who has the benefit of video replays. No sir, being the man in the middle is certainly no picnic and although I may disagree with some of their decisions from time to time, I respect what they do and I hope that they get the training, support and whatever else is needed from their association and the NRL in order to do a better job. The point is I just watched the best game of Rugby League this year.